The first day I ever set foot in Tokyo Disney sea was a dreary affair. A morning drizzle kept most of the day soggy and gray, and as a result, I primarily focused on attractions and shows rather than photographing the grandeur of this magnificent park--though I still took a fair share of photos, just inside things rather than outside. Fortunately, the following day provided much better outdoor photographic conditions, and my vacation a year later, in 2016, provided fantastic weather for most of my stay in Tokyo in general. Tokyo Disney Sea is a dangerous enough park for memory card exhaustion just as it is. But thrown in beautiful lighting conditions? Well, goodbye memory space. I rattled away a plethora of photos everywhere. But some places still stand out, and the peaceful beauty of the Cape Cod section of the American Waterfront still etches into my memory. 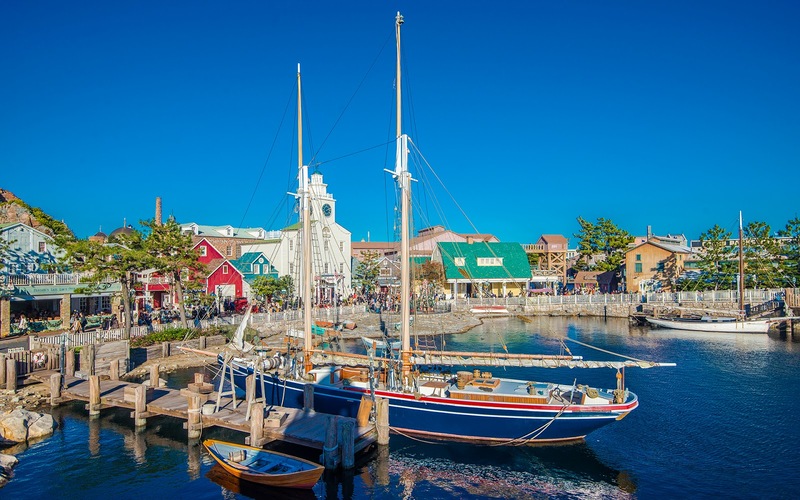 This romantic recreation of a New England village doesn't really have any actual attractions, other than a stop for the Disney Sea Transit Steamer Line. But it's just plain pretty, and the atmosphere is one of serenity and relaxation--even when crowds are packing the walkways or jostling for the best Duffy photo ops (he's a fixture around these parts). Scenes like this just make me happy, and ultimately, that is the biggest factor in the magic of this wonderful "Sea of Dreams." A stunningly beautiful day along "Cape Cod" in the American Waterfront portion of Tokyo Disney Sea.